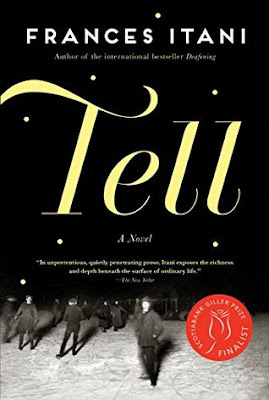 This month I read Tell by Frances Itani. I really enjoyed reading this book, like actually reading it, not just the story. It took me a few weeks to get through it because I was busy with other things, but each time I picked it up, I was able to fall back into the story with no problem, it felt comfortable, the characters were familiar, and the story, although intricately detailed, was not overwhelming so I could easily pick up right where I'd left off. The story takes place right after World War I in Deseronto (a village in Ontario between Belleville and Napanee). The story goes back and forth between a young man, Kenan, returned from war, and his wife's aunt and uncle, Maggie and Am, with a variety of other characters. I always like reading about familiar places, and although I have never been Deseronto, I could easily picture it in my mind. It kind of reminded me of Road to Avonlea, and it was also neat that I started reading it right after Remembrance Day when I was already thinking of war times. I was even using the Passchendaele bookmark E got at school. There are some very sad parts in the book, some things that go unsaid that should be spoken, some loose ends, and a few uplifting moments. As I said above, I just felt very at home with the story and although you could argue the plot kind of plods along, I enjoyed that. It felt like I was rejoining a community when I would pick up the book again. It also takes place during December, so the timing worked well with the time I read it, although it was much colder in their time and they were already skating on the bay. This is definitely a book I would recommend to others. We read Requiem by the same author for our book club last year. This was equally good. As I was reading about this book I found out that it is a sequel to a story about Kenan's wife and her sister called Deafening. I will definitely be picking up that book in the new year.